A friend offered to take me out for my birthday about a month ago and said I could pick the place. I originally wanted to go to Bunky’s but they had a 2-hour wait and we were both too hungry for that. Then we were going to go to one of the two new breweries on Atwood Avenue but there was absolutely no parking anywhere near either of them. So when we were driving down Atwood Avenue we saw Dobhan, a Nepalese restaurant owned by the same person that owned Chautara. 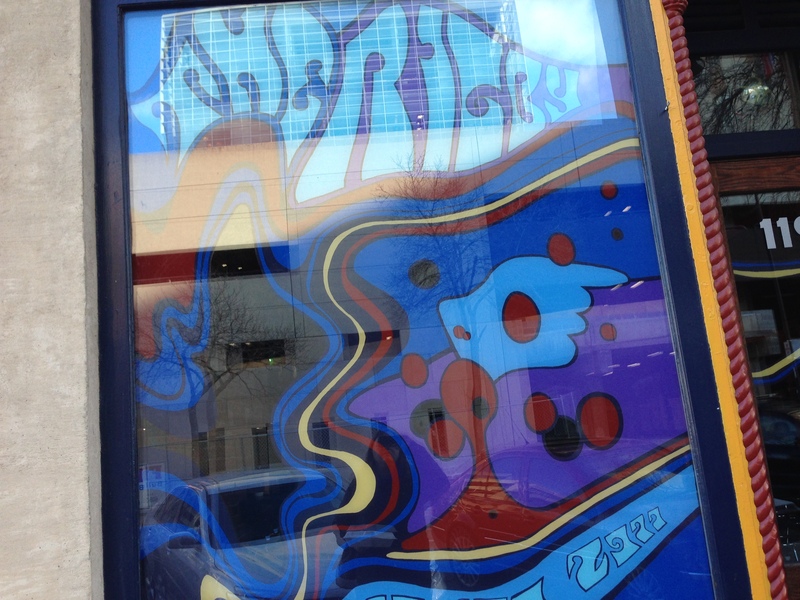 I loved Chautara and was sad when it closed. The owner said he couldn’t run both so he decided to keep Dobhan open and close Chautara, so I figured it would be a good choice. We walked in to a half-empty dining room that was very bright and had an eclectic mix of decorations. It took a bit before we were seated because I’m pretty sure the only waitress was also the hostess and was clearing tables. The menu is an odd mix of food that claimed to be Nepalese. Both of us liked Chautara so we had high hopes for Dobhan. We both decided to start with a samosa. They came relatively fast but were a complete disappointment. The pastry was dry. The filling was tasteless and also dry. There wasn’t even enough of the filling to fill the samosa. 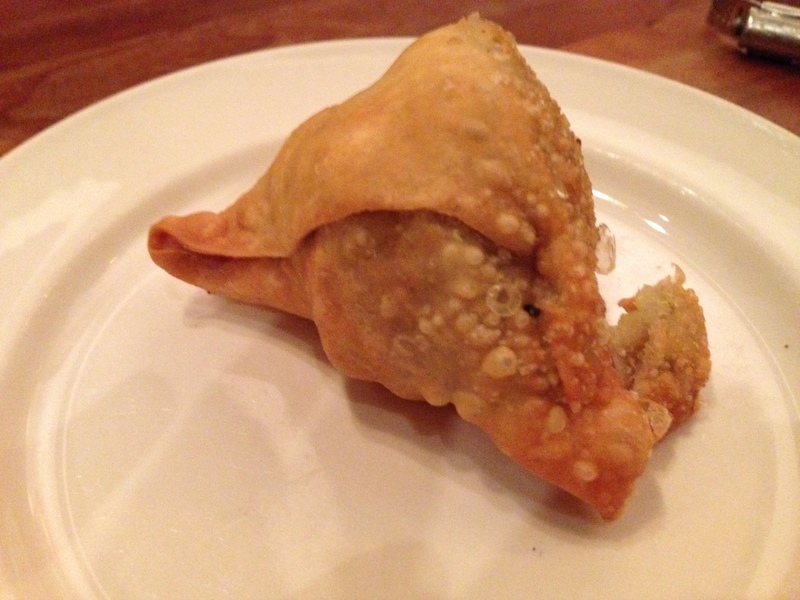 Bottom line: I’ve had frozen samosas that are better. Each entree comes with either a salad or dal. I went with the dal because in my mind dal is a good way to determine the quality of an Indian/Nepalese restaurant. And I was right again. This dal was luke warm, flavorless and had more broth than ingredients. 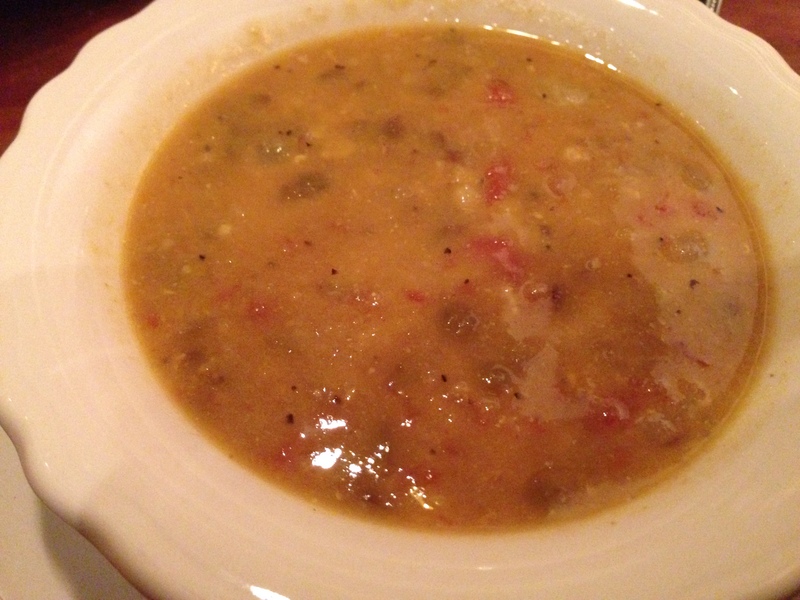 I think dal should be the consistency of pea soup, be filled with vegetables and have strong flavors. I was not impressed with their dal and it was a hint of what our entrees would be. I got some beef dish (it was so bad I didn’t even write the name down). It was a couple chunks of beef in a flavorless sauce with some limp veggies. 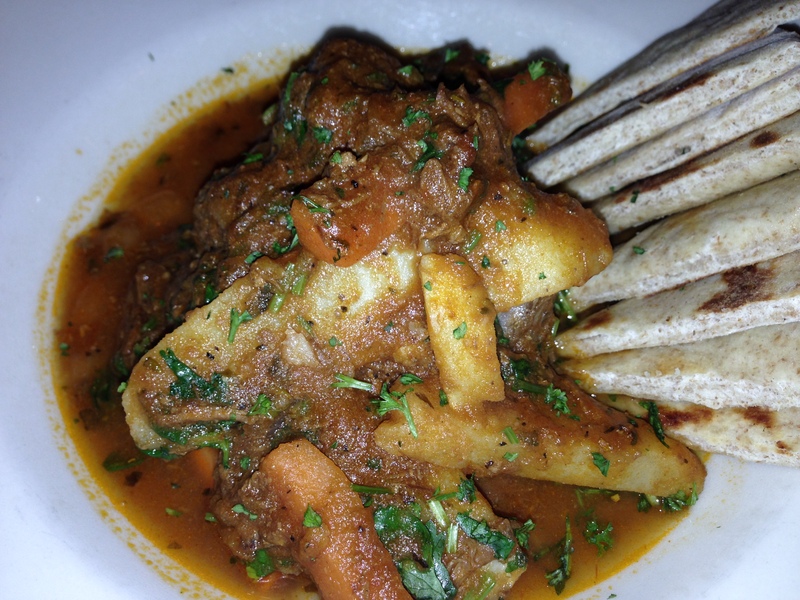 The dish also came with some dry and partially stale wheat pita bread. The beef overcooked and very dry, and there was absolutely no flavor to the sauce. FOODNOTES: My hope when deciding to go to Dobhan was that I would like it as much as I liked the owner’s other restaurant Chautara. I was badly misguided in that hope. Everything I ate at Dobhan was flavorless and pretty forgettable. Chautara’s menu used to have a salmon dish that came with perfectly cooked garlicky vegetables and a mango salsa on top. I loved that dish and am sad to say there was nothing even close to it on the Dobhan menu. I would highly recommend not visiting Dobhan. This place put a sandwich on Stella’s Spicy Cheese Bread!!! 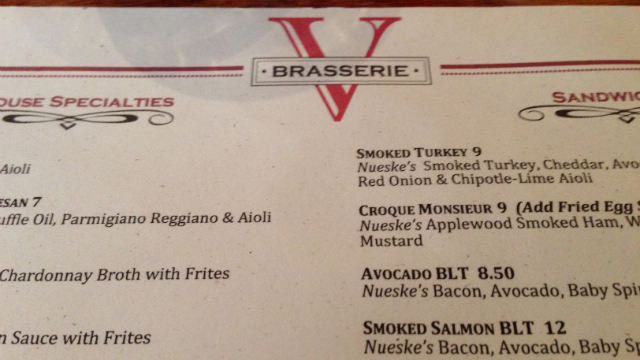 I thought the novelty of Brasserie V (pronounced “V,” not five) on Monroe Street would be lost on me because they’re known for their beer selection, specifically Belgian beer. But when I went there for lunch with a friend before the holidays I was pleasantly surprised by the menu options. The restaurant specializes in mussels, french fries, steak and duck. A couple years ago I was very reluctant to try mussels at a Restaurant Week dinner I was at, but ever since jumping in with both feet I usually get mussels when I see them on the menu. 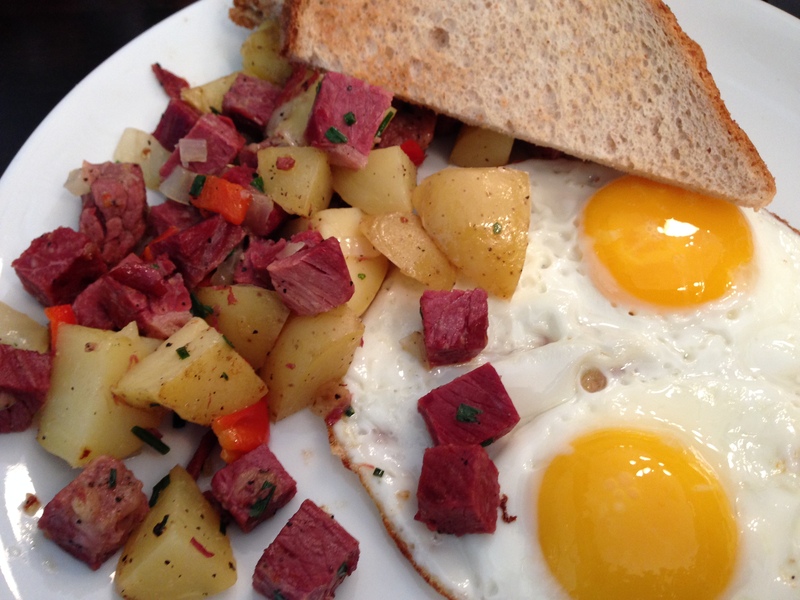 Their menu also has sandwiches, burgers, salads and pub-style appetizers. My friend got the Moules et Frites (mussels and french fries). The mussels came out in a huge crock covered in steaming garlic and wine sauce. Mussels aren’t really special unless the sauce they are cooked in is special. This light, garlicky broth was good but nothing I haven’t had before. The frites were super good. They were crispy, fried to perfection and were perfectly salted. 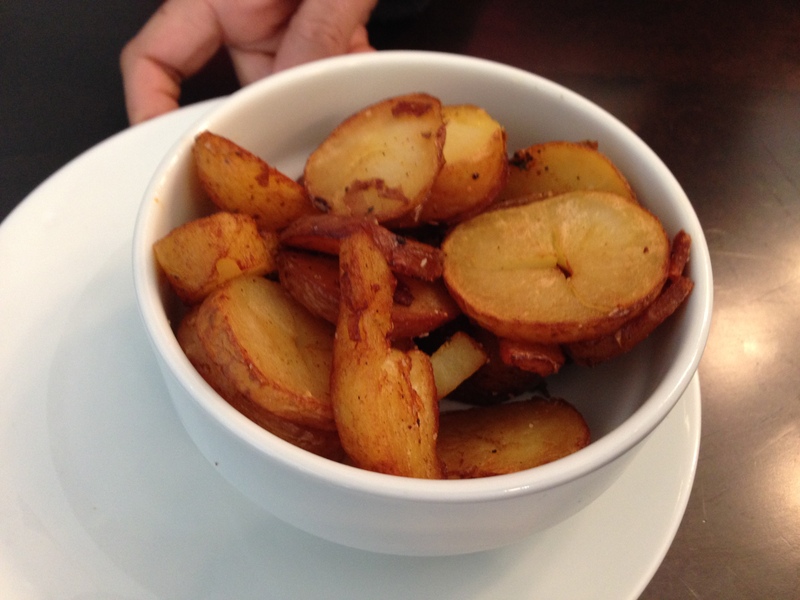 I have a weak spot for french fries and probably always will, so they were my favorite part of the meal. The aioli was a good combination of creaminess and garlic flavor. All in all, the Moules et Frites were good and for $11 at lunch, not a bad deal either. I’m glad my friend got the Moules et Frites for two reasons – one: because I really wanted to try them, and two: because I had my eye on something else. I’ve lived in Madison for a little over six years now and definitely consider myself a Madisonian, so the list of ingredients on the roast beef sandwich got my attention. The sandwich is made with Stalzy’s roast beef (I’ve given them rave reviews multiple times), house-made giardiniera (I love spicy, pickled peppers and veggies!) and dill sour cream on STELLA’S SPICY CHEESE BREAD. I mean, come on! Any sandwich would be 100% better on spicy cheese bread! Without all of those amazing ingredients the sandwich probably wouldn’t have been as good. The roast beef was perfectly seasoned and lean. The giardiniera had good pickle, but could have been spicier and there could have been more of it on the sandwich. Same thing with the dill sauce – it was good but there could have been more of it. And then there’s the Stella’s spicy cheese bread. That’s definitely what takes this sandwich over the top! Any other bread just wouldn’t do. With the amazing ingredients this sandwich could be my favorite in Madison – they just need to put more giardiniera and dill sauce on it, otherwise it is a bit dry. The price for the sandwich ($12) was a little high considering all of the ingredients on my sandwich came from Madison and the $11 mussels had to be flown here. The couscous salad I got as a side (probably should have gotten the pub chips or salad) was forgettable. 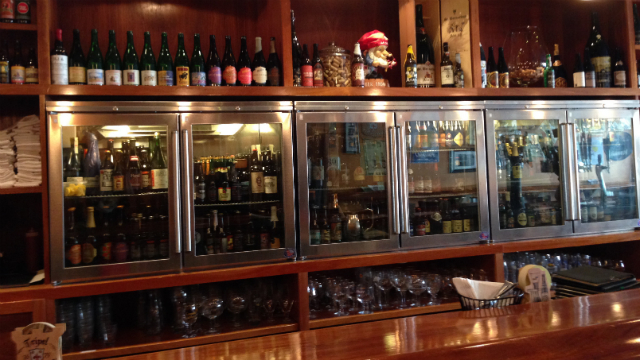 I can’t speak for the beer selection because I don’t drink beer, but the atmosphere of the place was nice. There are two rooms. The first one is a smaller room with a small bar, about a dozen tables and is cozier. The second one (a recent addition according to the owner) is bigger, with a large bar, more space for mingling and additional tables. 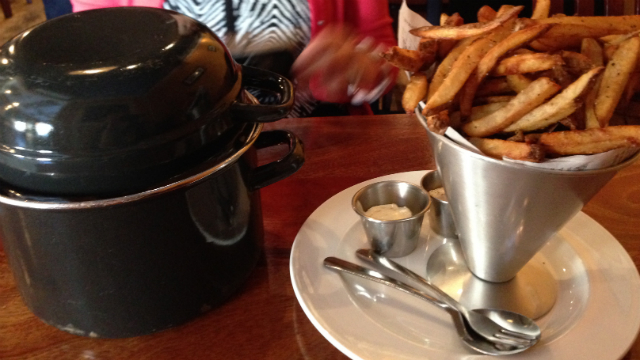 FOODNOTES: If you’r craving mussels and wonderfully prepared french fries, Brasserie V would be a good choice. It’s in a good location (usually easier to get to than downtown restaurants that offer moules et frites). 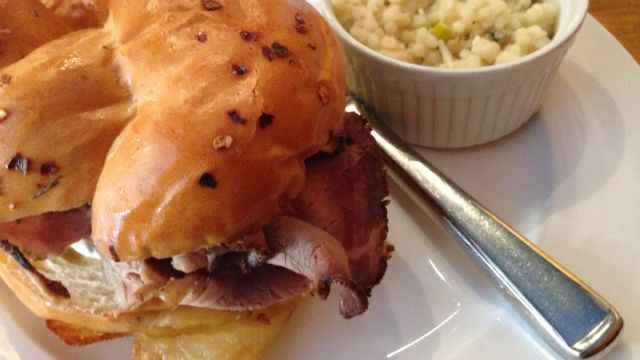 The roast beef sandwich could be a crave-able sandwich with two small tweaks – but the Madison ingredients really make the sandwich special. Whoever thought about putting a generic roast beef sandwich on Stella’s Spicy Cheese Bread deserves an award! The prices are a bit high, especially the lunch prices. I got a gift card for Brasserie V from my Secret Santa this year, so I will return – probably to try their steak and frites this time. Quiche, pop tarts, daily specials are anything but Humble. I am not a huge fan of sweets but I can be swayed by a good-quality, freshly baked cinnamon roll or tart most of the time! I don’t waste my time with pre-made sweets or generic cookies because they’re usually disappointing. 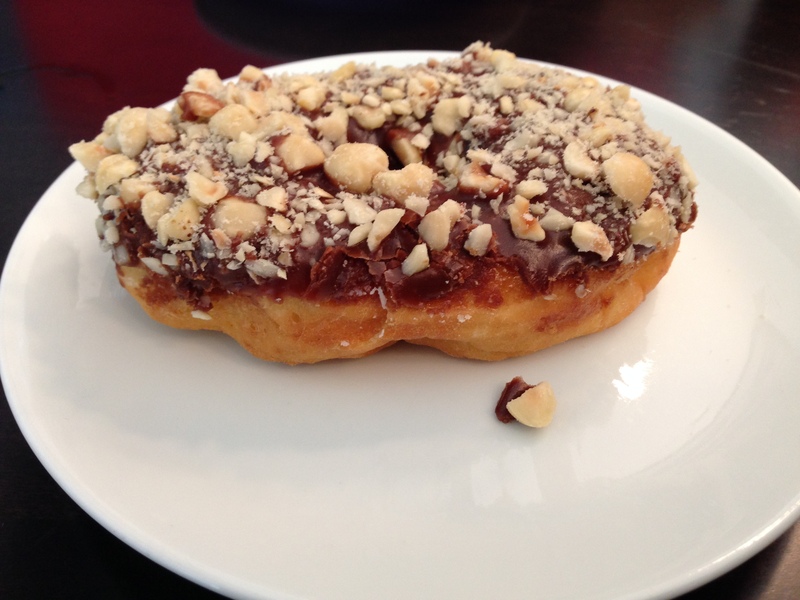 But when I heard about a new bakery that opened in the Monroe neighborhood I got excited. Then, when I heard it focused on pies I got a little less excited because pies are not my favorite. I found Humble. Sweet and savory pies on Facebook and started watching their daily specials (which changes regularly and they also don’t offer a permanent menu – I like that!). They offer five or six different baked goods in their case a day along with something savory like quiche or savory pies. Their creative offerings (hand pies, homemade pop tarts, etc.) is what finally clinched my decision to go. I went with a friend who lives in the neighborhood before the holidays. It is just off Regent Street east of West High School on Allen Street. I’m giving specifics on its location because it is very easy to drive or walk past! The inside is very small – it consists of a counter, a bakery case and two small bistro tables. It looks like they may have picnic tables outside in the summer but they were covered with snow when we went. The bakery case had a couple different options the day we went but both of us had heard about the homemade pop tarts and opted for the chocolatey one. 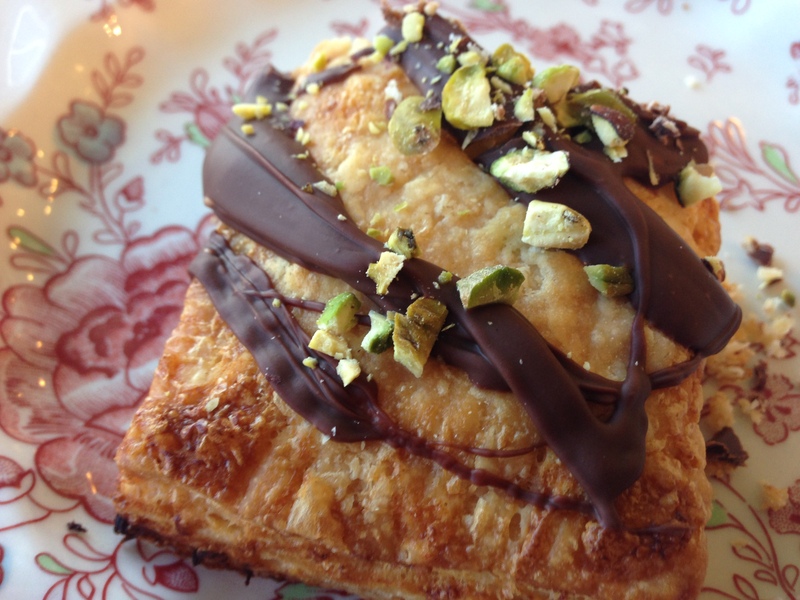 The crust was amazingly flakey and buttery, the filing was thick and fudgey, and the pistachios on top added a great crunch and flavor contrast. I loved my half and probably could have eaten a whole one by myself! We also decided to split a pice of quiche, which was a good decision because the piece we got was huge. I don’t 100 percent remember what flavor we got but I think it had ham, cheese and potatoes in it. I’m usually not a quiche person because I find the crust cumbersome and unnecessary, but this quiche shined BECAUSE of its crust. The fluffy and flavorful egg filling was elevated by the buttery and perfectly moist crust. FOOD NOTES: If you don’t live in the area, it is a little difficult to find parking to get to Humble but once you do find parking, it will definitely be worth it. I’m almost glad I don’t live closer because it would be bad for my diet if I had access to their daily items so often. 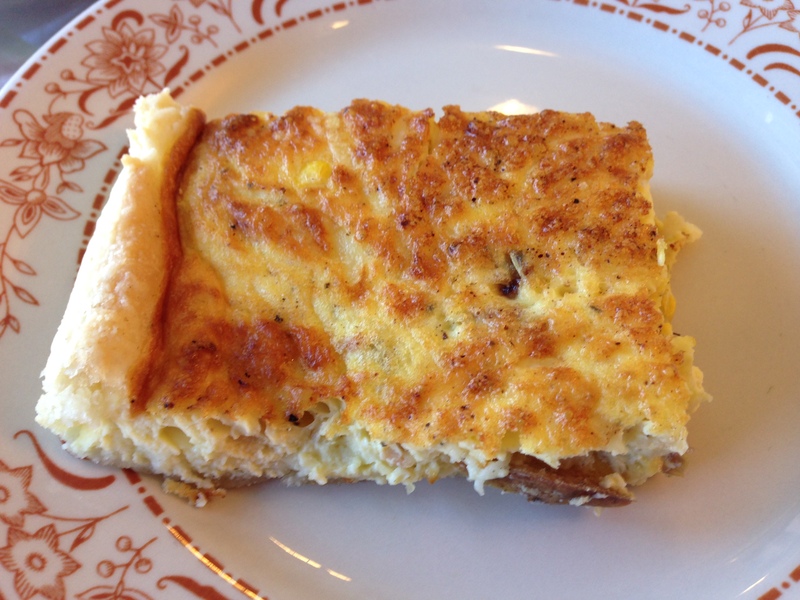 The homemade pop tart we got was amazing, and the quiche was one of the best ones I’ve ever had. 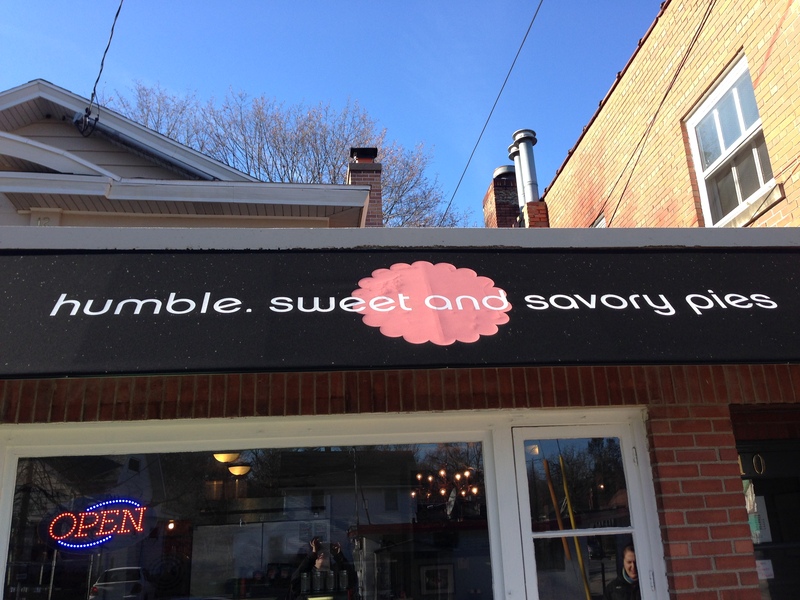 Humble also has their own blend of coffee made by Just Coffee that was very rich and flavorful. 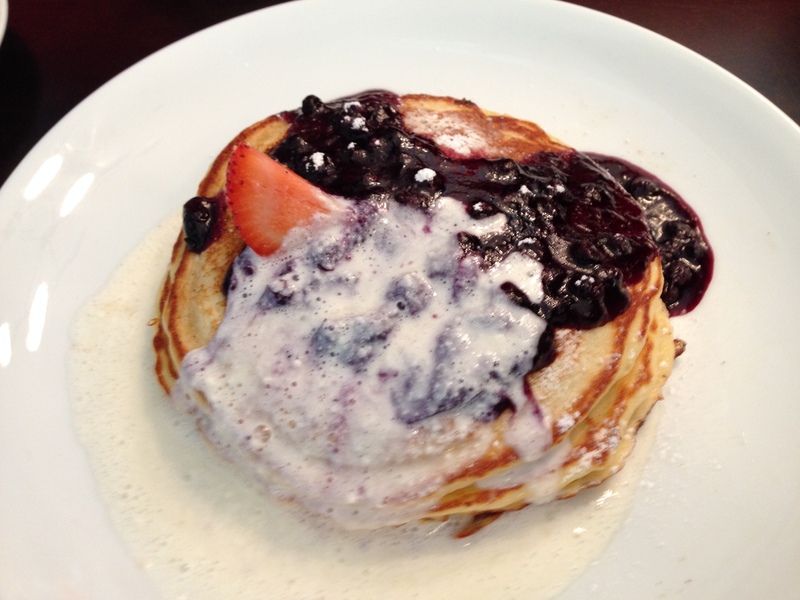 It wasn’t flavored or too bold, which pairs very well with the sweets. Don’t count on getting a seat in their tiny, two-table shop, so be prepared to take your treats to go. Initially I thought the prices were a tad high, but I can honestly say they are worth it – the ingredients and quality warrant the prices. I will definitely be back because their Facebook posts keep tempting me with extremely unique and decadent daily specials. 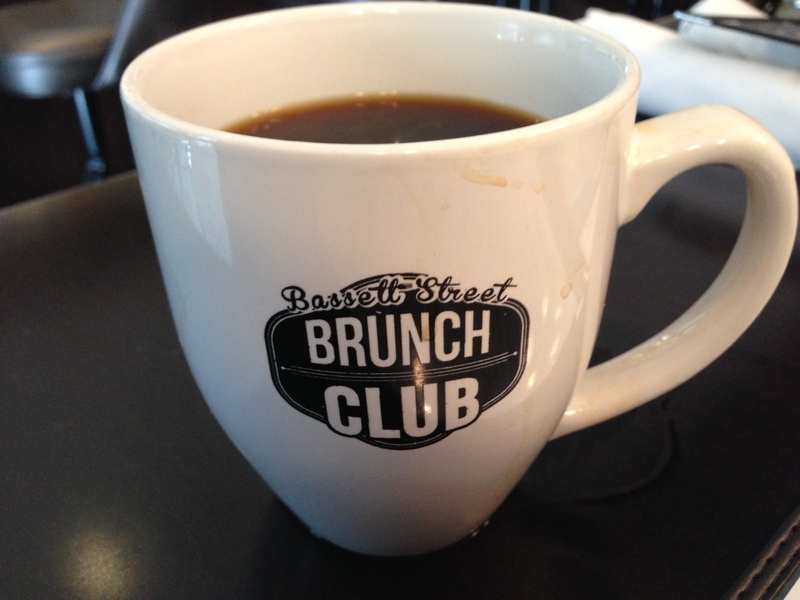 I’m a huge Beatles fan so when I heard a Beatles-themed restaurant opened downtown I had to put it on the list. The Rigby opened over a year ago, but since I hadn’t heard any good reviews on the place I didn’t put it at the top of the list. A friend and I finally decided to go for a late lunch one day and had mixed opinions. I looked at the menu and knew all of the dishes were associated with Beatles songs, so I assumed the restaurant itself would be Beatles-themed, but I was wrong. The restaurant is three levels. The first level is the bar area and it had some records and posters on the wall (not enough in my opinion but it was a good effort). The second level was very odd – it had a lot of non-Beatles decor and a mural that was supposed to represent Beatles songs, but it kind of missed the mark. The basement had a sign above the steps that labeled is ‘The Cavern Club,’ so that went with the theme but I didn’t go down there. The entire building has exposed brick and wood floors that would lend itself very well to Beatles decor and memorabilia, but I was very disappointed. The odd glass light fixtures on the second floor shaped like umbrellas were absolutely awful, and the tacky banquet tables and chairs didn’t suit the feel of the restaurant I was expecting. Moving beyond the atmosphere and decor of the restaurant, the menu was expansive and we ordered a lot of food. 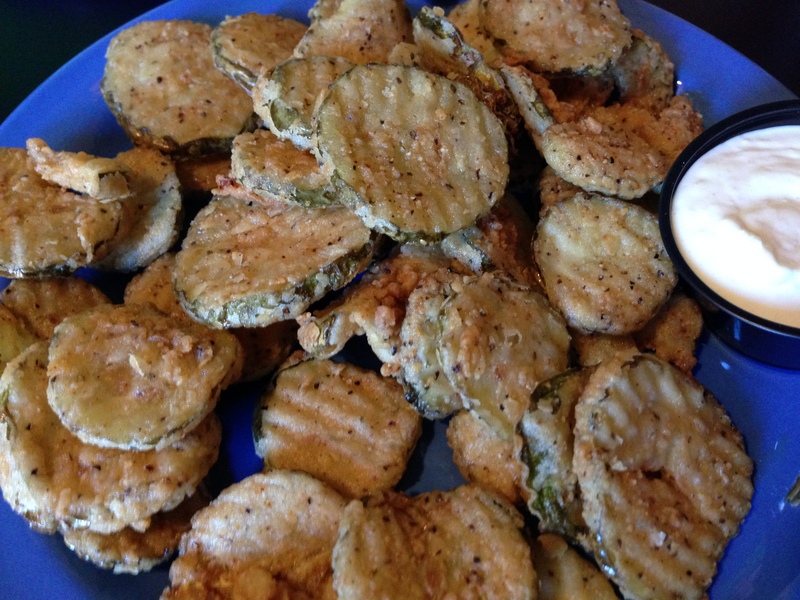 As everyone knows, I’m a fried pickle fanatic so when I saw them on the menu I knew I had to order them. The menu is pretty confusing – they have a list of appetizers and then what they call ‘Righteous Additions.’ They are basically the same in concept so I have no idea why they are listed on different parts of the menu. After clarifying that the Please Pickle Me Righteous Additions basket and the And Your Curd Can Sign appetizer would be the same size, we decided to get both. The fried pickle chips were perfectly hot, crunchy, salty and not overwhelmingly battered. I like it when I can see pickle through the batter. The creamy horseradish sauce was unusual (normally fried pickles come with ranch dressing), but very good. The best thing about the pickles was the huge portion that you get – enough to take home leftovers! The fried cheese curds were also hand battered and fried fresh. They use fresh cheese curds from Wisconsin, which definitely makes a difference. They were hot and cheesy with the same perfectly fried batter. The creamy buffalo sauce was mostly flavorless and didn’t go well with the cheese curds at all. We used the creamy horseradish sauce that came with the fried pickles for the cheese curds too. 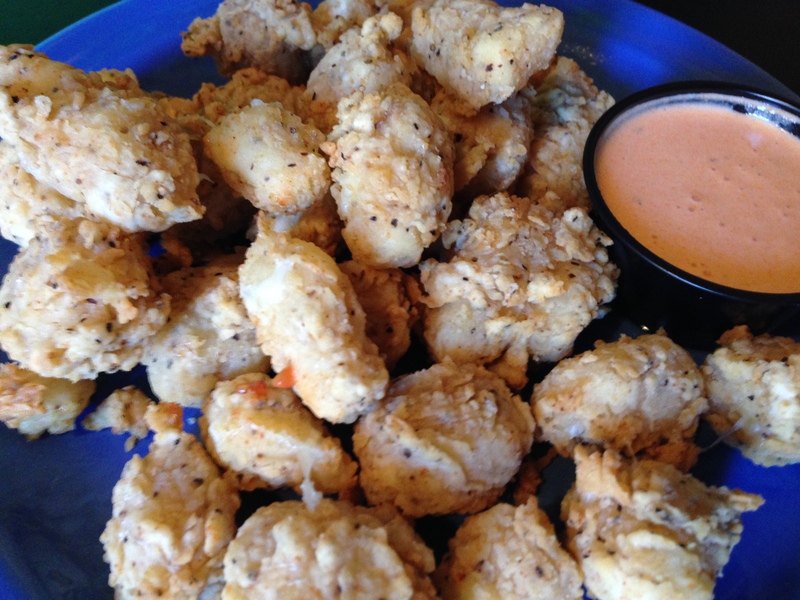 The curds also came in the same large portion as the fried pickles – more leftovers! For entrees they offer Beatles-themed burgers, sandwiches, wraps and salads. Most of them don’t look too exciting and if they’re as over-the-top as the Eleanor Rigby Burger I got, they probably aren’t worth ordering. 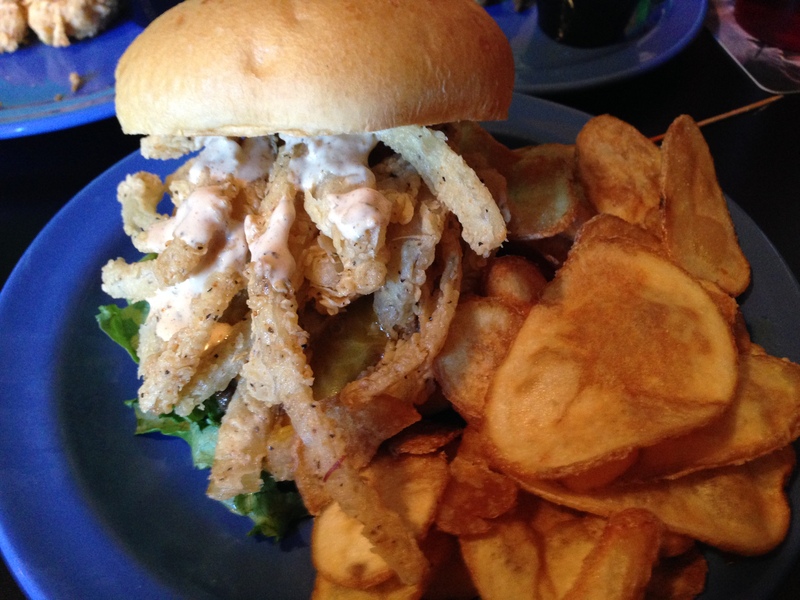 The Eleanor Rigby burger comes with Wisconsin cheddar cheese, fried onion straws, a signature sauce, lettuce and tomato on top. The burger patty and bun were absolutely nothing special, and the amount of fried onion straws on top were way to overwhelming. I was really not impressed with my burger. The homemade pub chips that came with the burger were fine. FOODNOTES: The only thing more disappointing than the burger was the lack of Beatles decor in the building and lack of Beatles music overhead (we were there about an hour and we only heard one Beatles song played the entire time). The burger I got had way too many fried onions on top and the rest of it was uninspiring. The best part of Rigby’s is their fried appetizers/righteous additions. The fried cheese curds and pickles were top notch. I would suggest avoiding the creamy buffalo sauce and trade it in for the creamy horseradish sauce when getting the fried cheese curds. The prices are a bit high but if you get just appetizers (the thing I liked the best), it wouldn’t be too bad. 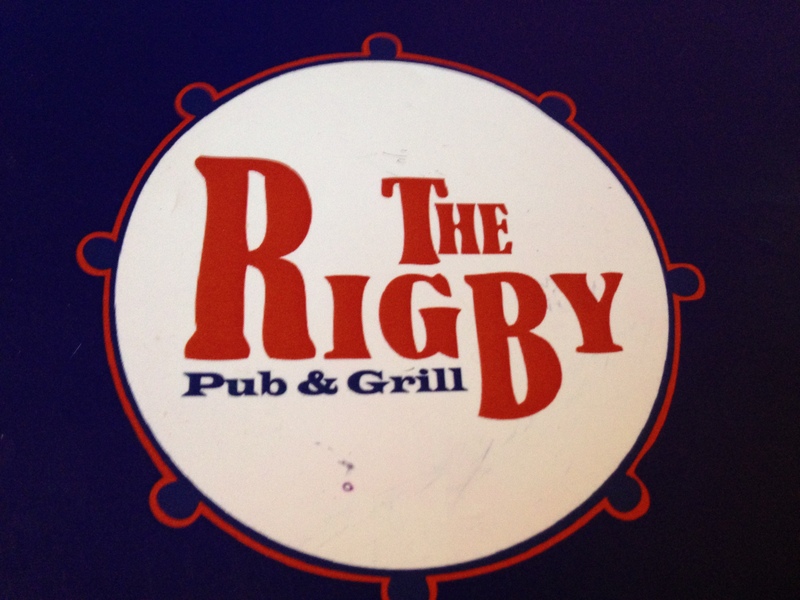 I wouldn’t suggest going to the Rigby for a meal, but drinks and appetizers would be a good option.